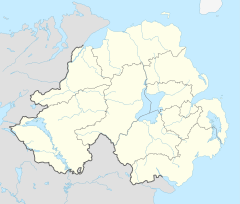 Belfast (frae the Airisch Gaelick Béal Feirste, meanin 'saundy fuird at tha fit o tha river'; kent as Bilfawst or Bilfaust in Ulstèr-Scotch) is the caipital citie o Norlin Airlann (Lallans Northren Ireland). It's tha mucklest urban aurie in Norlin Airlann an tha Stewartrie o Ulstèr an the seicont-mucklest citie on the islann o Airlann. ↑ "Belfast City Council". Retrieved 22 February 2016. ↑ "Census for post 1821 figures". Cso.ie. Archived frae the oreeginal on 20 September 2010. Retrieved 12 August 2010. ↑ "Home". Histpop.Org. 2 April 2007. Retrieved 13 November 2010. ↑ NISRA. "Northern Ireland Statistics and Research Agency – Census Home Page". Nisranew.nisra.gov.uk. Archived frae the oreeginal on 4 April 2010. Retrieved 12 August 2010. ↑ Lee, JJ (1981). "On the accuracy of the Pre-famine Irish censuses". In Goldstrom, J. M.; Clarkson, L. A. Irish Populatioe, Economy, and Society: Essays in Honour of the Late K. H. Connell. Oxford, England: Clarendon Press. ↑ Mokyr, Joel; O Grada, Cormac (November 1984). "New Developments in Irish Population History, 1700–1850". The Economic History Review. 37 (4): 473–488. doi:10.1111/j.1468-0289.1984.tb00344.x. 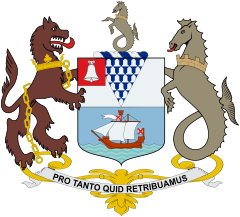 ↑ "Belfast City Council. 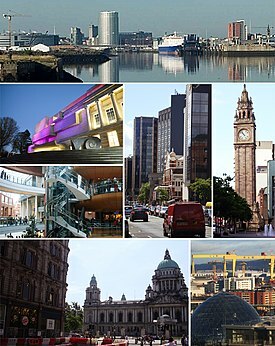 Belfast: A Profile of the City. Demographics". Belfastcity.gov.uk. Archived frae the oreeginal on 25 September 2010. Retrieved 12 August 2010. ↑ "Placenames/Logainmneacha: Belfast". BBC Northern Ireland - Education. BBC. Retrieved 2007-05-17. ↑ "Northern Ireland". MSN Encarta - Northern Ireland. Microsoft. Retrieved 2007-10-29. Wikimedia Commons haes media relatit tae Belfast. This page wis last eeditit on 17 Apryle 2018, at 22:23.